In the last gdgt podcast I found out about the announcement of the Eee Keyboard, one of the newest additions to the Asus Eee line of lower power computers and netbooks. The Eee Keyboard has several features that make it particularly interesting. First of all, if it’s not obvious yet, the entire computer is housed inside of a keyboard casing. To the right of the keyboard there is a reasonably sized, and vertically oriented, touch sensitive LCD display that doubles duty as the trackpad and secondary display. 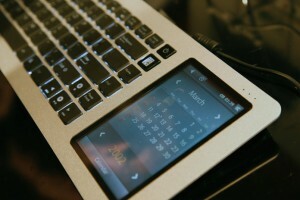 Of, if you’re not connected to an external display, the built in screen will serve as the main display. The “Keyboard” has wired ports for USB, VGA, and HDMI connectivity, but most notably the unit has wireless HDMI built in, letting you use the computer as a MediaPC or mobile workstation without having to physicaly plug up to your TV. At the moment it is a prototype, but should be coming to retail in the near future. I can’t tell if it has a battery built in or not… If it has a battery I think it could be a really interesting gadget. This concept isn’t new. When I first saw it I instantly though of the AlphaSmart Dana PalmOS device. You can see more photos at both Gizmodo and Engadget.